Documentary Testimonies examines documentary films that compel us to bear witness, move us to anger or tears, and possibly mobilize us to action. Comprising ten new essays and a substantive introduction, this interdisciplinary volume examines audiovisual testimonial practices, forms, and institutions. Topics include: technologies of capture, storage and circulation; problems of historical veracity/frail memory; generation of video archives--official, renegade, and ephemeral; limits and potentialities of documentary as public record; architectonics of memory; ethics of witnessing and commemoration; human rights and activist publics. 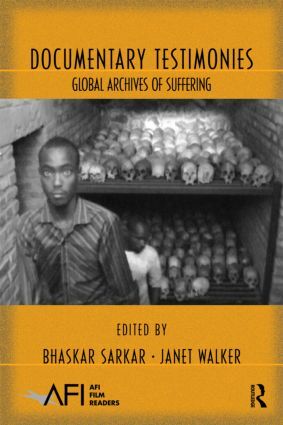 The essays provide in-depth analysis of archives of social suffering tied to particular locales: Cambodia, Chiapas, Darfur, India, Indonesia, Korea, New Orleans, Norway, Rwanda, South Africa, and Washington, DC. The contributors focus on the generation and use of testimony by public administrators and institutions, human rights activists, documentary filmmakers, and others with interest in environmental justice, human rights, social advocacy, and the commemoration/prevention of genocide. Thus, this volume aims to investigate, from a critical and translocal perspective, testimony as social practice.